Views A and B both have a vintage feel to them. 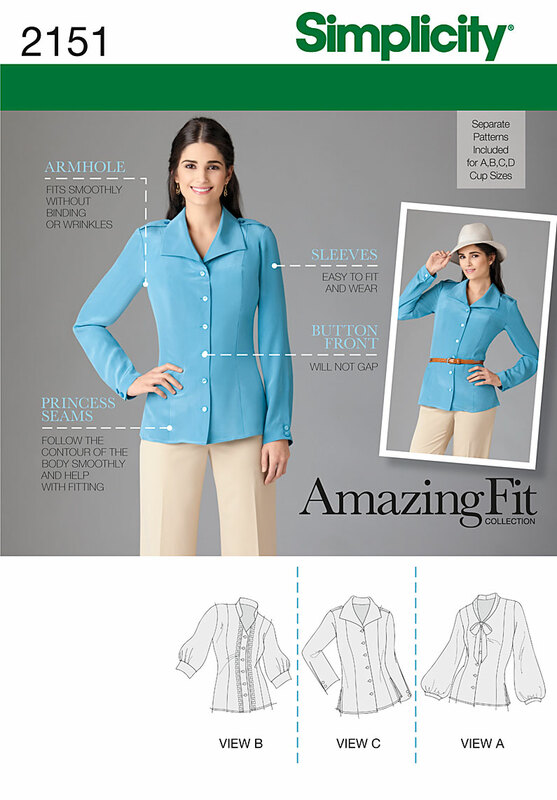 Simplicity 2151 includes four different side front patterns, one for each cup size A through D. The center front piece is cut at different lengths, depending on the cup size. It also includes 1 inch side seam allowances and corresponding 1 inch seam allowances on the sleeves for fitting. And it has what is probably a crazy amount of ease — 4½ inches at the bust and 6¼ inches at the waist! 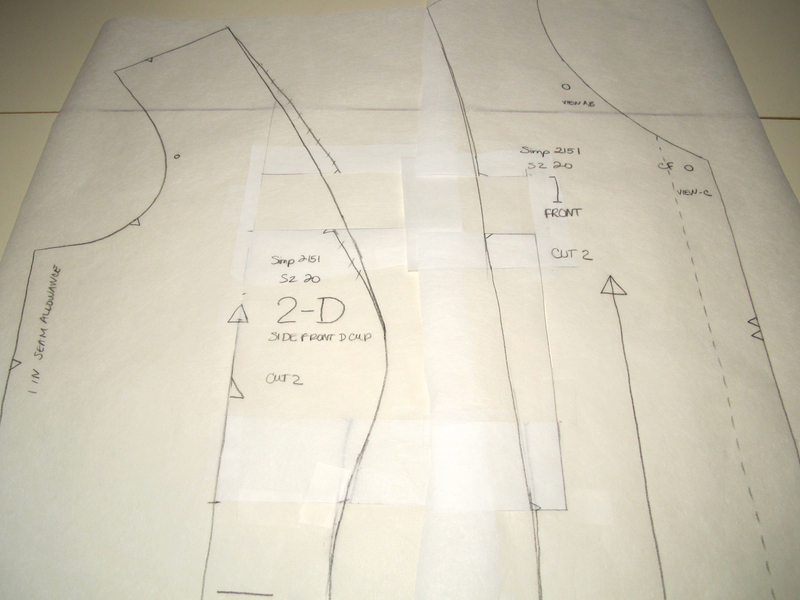 I’m getting better at analyzing how to alter a pattern from close examination of the pattern pieces, which in this case involved looking at the ease of a couple of ready-to-wear blouses I have whose fit seems about right. The ease of this pattern wasn’t far off of those, so although I really do think it will be too much, I’m not sure how much to take out. I’m also sure the waist needs to be lengthened, but I couldn’t be sure of how much. I even toyed (briefly!) with the idea of making a smaller size, but I decided to keep to my usual size for the shoulder fit. In the end, there was only one alteration I was confident enough of to make to the pattern: lowering the bust point two inches. It is a wearable muslin, after all. I lowered the bust point 2 inches by cutting around the bust projection on the side front and the corresponding area on the center front, moving them down and redrawing the lines using my design ruler. After my one alteration, I moved on to cutting all the fabric and then cutting out the interfacing. And that’s when I ran into the same problem I had with the skirt. I goofed up the interfacing! I’m sensing a pattern here. 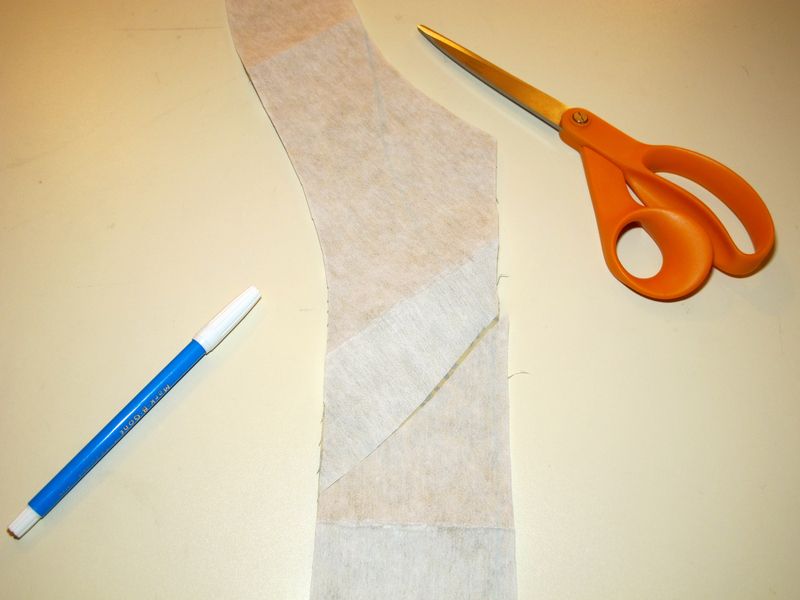 As I’ve shared before, my favorite part of a project — besides finishing, of course — is sewing the first construction seam. My least favorite part is cutting and fusing interfacing, which probably explains why, after messing up the interfacing on the skirt, I messed up the interfacing on this blouse. Once I cut out the fashion fabric, I’m ready to sew. But wait! There’s still all that interfacing to cut and fuse. I just hate that. So apparently I rush through it and just make a mess of things. At least now that I’ve recognized my pattern, I can make sure to pay attention and maybe even cut it out correctly next time. Meanwhile, I still have marking and fusing to do before I get to that first construction seam. Drat. Corinne, that’s the perfect word — tedious! I also use the same interfacing for most projects, and I’d love to lay in a supply of interfacing. It’s on sale 50 percent off this week at Jo-Ann’s, so I may be heading there today. I just checked my supply recently. I am in good shape. I just have not had much incentive. I miss the pursuit of the good fit, the design elements etc. It has been a tough year but I remain hopeful that I will soon be using up some of that interfacing! Best of luck at the sales.